Bears are more than just the cute little toys in stores across the world. Native American Shamans believed that bears were the link to the spiritual world and conducted numerous rituals in their honour. In the Norse culture, the god Odin was often depicted as a bear. Early humans wore the hide and bones of bears in the belief that this would allow them to absorb some of the spiritual and physical powers of the animal. Bears have been long associated with Native Americans, who regarded these animals as great warriors, displaying incredible Strength, Bravery, and Power in the face of opposition. In the Sioux nation, the bear is associated with Healing and Medicin. Legend has it, that a sick bear was healed after eating leaves from a redwood sorrel plant. She was so elated by her sudden change in health, that she spread the word of the plant's healing benefits to her sisters in the Sioux nation. Haida Bear tattoos originate from the oldest indigenous tribe in North America, the Haida, who live in British Columbia, Canada, and Alaska. In this tradition, the Bear is a representation of Motherhood, Protection, Spirituality, and Wisdom (the animal is usually associated with an elderly kinsman). Haida Bear tattoo designs are either red, green, or black. It's hard to imagine the world today without this adorable toy. The Teddy Bear is named for the American president Theodore Roosevelt after word spread that he refused to kill a black bear cub while on a hunting expedition. As fate would have it, the toy was created by two firms working independently on opposite sides of the Atlantic: the American Morris Michtom and the Steiffs from Germany. Teddy Bear tattoo designs symbolize Love, Affection, Innocence, and are the quintessential symbol of childhood. Hip hop artist Eve is known for the distinctive paw print tattoos on her chest. Bear Paw and Bear Claw tattoos are believed to symbolize Good Luck, Stability, Power, and Mobility. Tribal tattoo designs are of spiritual significance in the regions from which they originate. While the exact meaning of each tribal symbol has been lost to time, Tribal Bear tattoo designs generally embody Spirituality and a deep connection with Nature and/or the Native American culture. 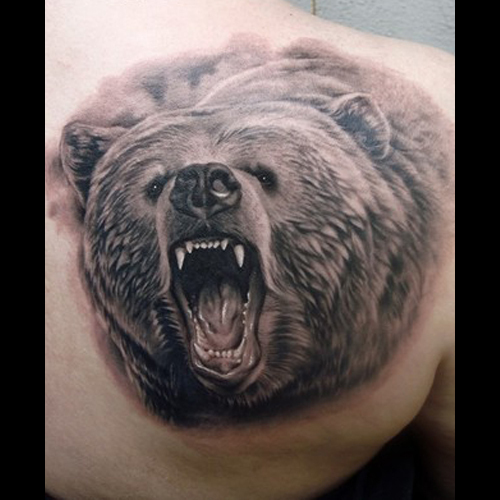 Bear Tattoos with Celtic influences are deeply rooted in Spirituality and Paganism. Wearing a Celtic Bear tattoo design usually symbolizes your connection with the natural elements, strong ties to the Irish tradition, and your spiritual side. The Grateful Dead Bear design was created by Bob Thomas as the back cover artwork for the band's album History of the Grateful Dead: Volume One (Bear's Choice). Released in 1973, Bear's Choice peaked at #60 on the Billboard's Top 200. The design pays homage to Owsley 'Bear' Stanley, who wrote and produced the album. Many persons often refer to them as the Dancing Bears, but don't say that to Owsley. Panda bears are one of the rarest and most famous bears in the world. Panda Bear Tattoos signify Good Luck, Harmony, and Balance. Pandas have long been associated with the Yin-Yang symbol in Chinese legends because of its distinctive black and white patterns. Both Black Bears and Grizzlies have many things in common, including striking fear into the hearts of humans and animals alike. If you wear any of these designs, then you identify strongly with the powerful, warrior spirit of the bear. The difference between these titans rests mostly on the coloration of each species; Grizzlies are brown while Black Bears are...well...black. Polar bears have cultural and spiritual significance to the indigenous peoples of the Arctic. In the Inuit culture, the polar bear is the earthly incarnation of the Great Spirit, Tuurngasuk. The Eskimos revere these animals for their superb hunting skills and the Nenets of Siberia believe that wearing a polar bear's canine teeth protects you from harm. Eskimo and Inuit tribes have countless folklore legends that speak of the bear's devotion and love to its cubs. This is one of the reasons for Coca-Cola's use of a polar bear in numerous Christmas advertising campaigns. The California Bear became part of the state's flag in 1846 after a group of American settlers took control of the Mexican garrison, Sonoma. At the beginning of the Mexican-American War, the settlers proudly raised a crude, homemade flag that featured the California Bear, a star, and the words 'California Republic'. This design has come to signify Freedom and Independence, in honour of the settlers. Koala Bears are friendly, 'go with the flow' animals that are known for their calm demeanour and teddy bear looks. In Aboriginal folklore, Koalas are the keepers of Earth's memories, who crawled out of the depths to bring wisdom to humans and then took to the trees to keep watch. Koala Bear Tattoos symbolize a connection to Earth, Calmness, Wisdom, and Protection. Most Cartoon Bear tattoos are a tip of the hat to childhood days and feature beloved characters including Gummy Bears, Yogi, and of course, adorable Winnie the Pooh. These tattoos are really for the nostalgic among us. Gloomy Bear is a popular Japanese character created by Mori Chax. Gloomy frequently attacks his friend Pitty and just about anyone else in his path. He is always shown blood from his numerous encounters. Choosing the right tattoo design means finding one that has a special meaning to you. If you need some inspiration, then visit us at www.itattoodesigns.com or take advantage of our Custom Design Service, where our team can design a truly unique piece for you.